« Where in the World is Sardinia? You made my day. Going to Sardinia soon and this was just what I was looking for. Great. Have a wonderful time. Hello. With a car it is “doable,” however you may be rushed. Sardinia has lots of curvy mountainous roads, where I drive like a turtle. Lol. If you have any other questions don’t hesitate to ask. Hi. We are slowly building a home in Chiaramonti which is a small town in the middle of all these wonderful places. Our thoughts are that Le Pelosa beach is one of the most beautiful (water like the Carribean) but it does get very busy at high season. The old town of Alghero and the harbour is my favourite “built up” area. We are driving down to Sardinia end of May for 3 weeks and we can’t wait. Fantastic top ten! Love the map too. Hello Jennifer. Congrats for your blog, it´s very nice. 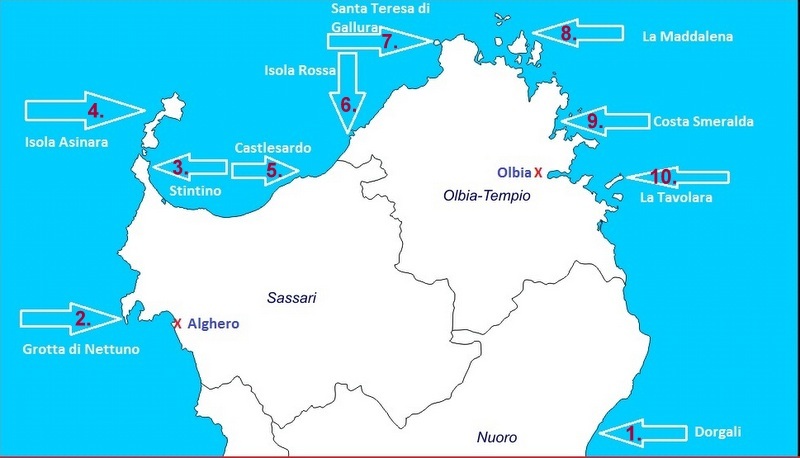 I will be there in Sardinia in June for 9 days. I would like to know which is the better choice to stay 5 days in Palau and 4 days Alghero or Stintino or another combination? 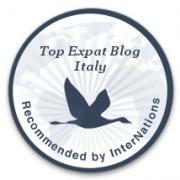 What´s about to stay 1 or 2 nights in Isola Maddalena? I know that it´s imposible to follow your top 10 list in 9 days. Which are the “MUST SEE”s? Sorry my english and congrats again. Which airport will you arrive at in Sardinia? Stintino is a stunning area as is Alghero. I haven’t spent time at Palau but have seen La Maddalena and it’s breathtaking. The drive from Palau to Alghero is about 2 hours, not too bad when you’re on vacation. Your itinerary is do-able. Enjoy. Have fun and if you have any other questions don’t hesitate to ask. Salute. Sardinia is great. Unspoilt country side, fine beaches and beautiful uncrowded spaces. I’ve seen many of the nuraghe and other extraordinary things you only find in Sardinia. One day I would love to visit the ancient settlement of Tiscali. Ahhh!! !We were in Stintino only a few weeks ago,spent 10 days there and also Alghero and Castelsardo (this place is magical especially at night! )……and now I am back in suburbia! Castlesardo is one of my favourite places on the island and I love Stintino! Where is suburbia for you? I’m sitting indoors in Milan, dreaming about returning to Sardegna for a nice vacation! I’ve been to a few of these places (Stintino, Dorgali and Grotta di Nettuno) but I’ll have to add a few of the others to my list of things to see the next time I get back there. Ciao! Thanks for stopping by and commenting. It’s a beautiful place to discover – Sardinia. Sardinia, is beautiful, we go to the south west part of the island, and pistis beach is the closest one to us, love the place, spend most of our time there when we get to Sardinia. I haven’t had the chance to play in the south, however I am looking forward to ti! …by the way, I am happy to announce that you have been picked as a winner of The Versatile Blog Award. Thank you Annette. I checked the link you have provided for more information regarding The Versatile Blog Award, and I don’t see anything written on this blog about the award. Do you have the correct link? You changed your header picture!!! I love it!!! It does look stunning with those colours!!! And I’d like to visit places one through ten please!!!! I have the header set to random, I was getting bored with the same ole pic.